This holiday season the Art Institute will be featuring a mid-18th century Neapolitan crèche, a new addition to the collection. This magnificent scene features over 200 figures, and it is the best and most complete example of its present kind in the United States. Our unique piece will be available to the public November 29th through January 5th. Sourcing for this exhibition took us directly to Naples. 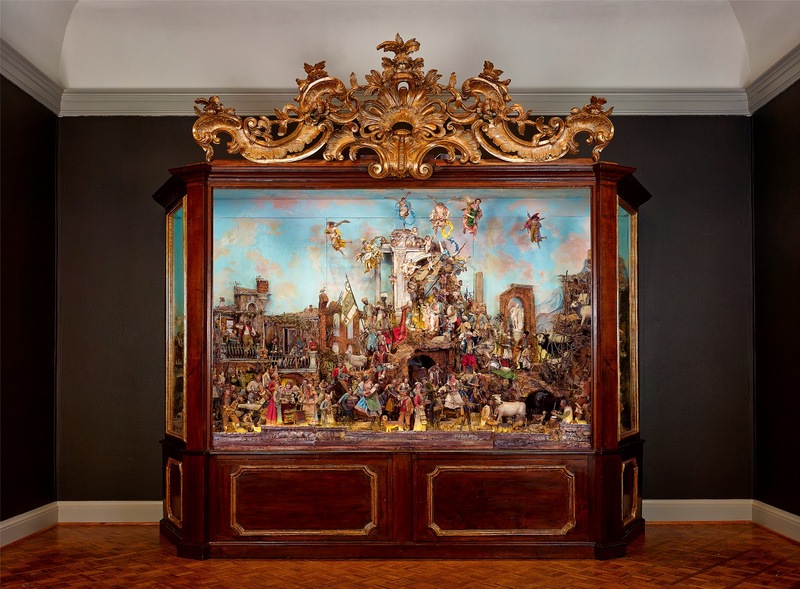 Through the eighteenth century in Naples, the most skilled craftsmen, as well as the most important sculptors and set designers, worked together to elaborate an artistic form that became internationally known as the Neapolitan crèche. The Neapolitan crèche extends largely from the sacred aspect that was initially concentrated around the holy family, Jesus, Mary and Joseph, surrounded by angels. The crèche figures are mannequins made of hemp rolled around an iron wire that gave the body flexibility. The head of oil-painted terracotta is modeled with glass beads inserted for eyes and dressed up with silk costumes revealing eighteenth-century fashion. While in Naples, we strolled through San Gregorio Armeno, a street market known for this one particular craft. We also had a front seat in observing some master craftsman doing what they do best- creating these traditional figures. This is an art form passed on from generation to generation with a level of detail and skill only achieved by years of practice. And if you are interested in a keepsake showing the Art Institute's Neapolitan crèche, we've curated a collection of souvenirs and stationery to tide you over until next years holiday season. Don't miss out on this rare piece of history, or our carefully developed assortment of products to support it. It's the perfect way to get into the holiday spirit.